“Probably The Best Football Beer Game”, an online interactive game, accessible via mobile and desktop, puts football fans’ knowledge to the test during this most anticipated football tournament. Fantastic prizes like an all-expense paid football viewing trip to UK (grand prize), official autographed football jerse (first prize) and limited-edition football merchandise are up for grabs when enjoying Carlsberg, “Probably The Best Beer In The World” and Carlsberg Smooth Draught, “Probably The Smoothest Beer In The World”. That’s not all! There are 300 Carlsberg limited-edition “Probably The Best Football Beer Merchandise” kits up for grabs. 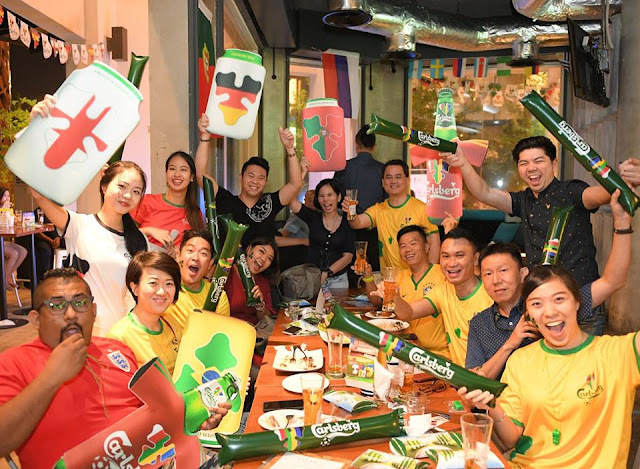 Each kit contains a full set of merchandise premiums – Jersey, Invertible Umbrella, Bottle and Can Sleeve of a specific country PLUS 1 carton of beer (Carlsberg or Carlsberg Smooth Draught). For all you footie fans out there, this will be a prized possession that you can treasure as a remembrance! There is Limited-Edition Football merchandise featuring six most revered football nations, namely, Brazil, England, France, Germany, Portugal and Spain to be won! “Carlsberg has always been passionate about football. Just like our long-standing partnership with the Liverpool Football Club of 25 years as well as our past collaborations with the Premier League and UEFA EURO championships. 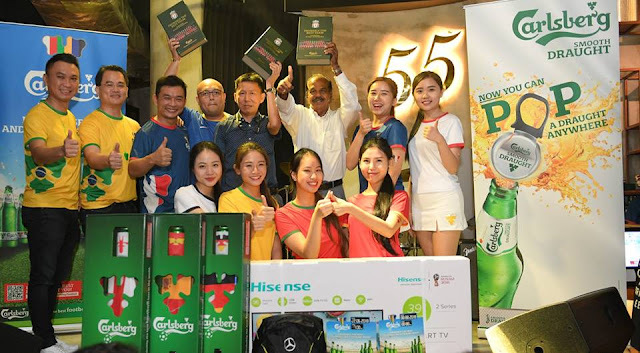 Dubbed as “Probably The Best Football Beer”, we thought what better way to reward our consumers who are football fans with a fun online game and exciting collectible football merchandise as give-aways and money-can’tbuy experience to watch a football match LIVE in the UK and have an autographed jersey,” said Pearl Lai, Corporate Communications & CSR Director during a Carlsberg viewing party at Fifty5 Kitchen & Bar. Since the launch of “Probably The Best Football Beer Campaign”, fans have been part of the action as they engaged in numerous activities, winning limited edition football merchandise, free passes to football parties and Bonus Codes which entitles them to accumulate extra points in the online game. Beer lovers and football fans had a blast at Fifty5 Kitchen & Bar as they watched Brazil beat Costa Rica 2-0 to a nail-biting finish as they enjoyed the happy hour promotion of RM5.50 a mug!Catch the matches live at upcoming “Probably The Best Football Parties” while enjoying Carlsberg and Carlsberg Smooth Draught at participating outlets. Carlsberg merchandises, Hisense TV, Vivo Smartphone and limited-edition Mercedes Benz gifts are also up for grabs! (Selangor); and The Red Lantern Bistro @ Miri (Sarawak). (Ipoh); Hard Rock Café (Malacca); and the ViBe (Johor). So, Cheers to “Probably The Best Football Beer Game” Ever!